Busy times have been had in the Teacups camp! Between a house move and usual mum/work stuff, I've just started a new exciting venture. It's called Clever Mamma and is a way for all those super amazing mums who run their own small business (and a household! 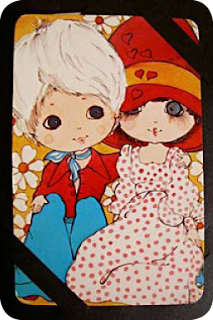 ), to connect to each other. 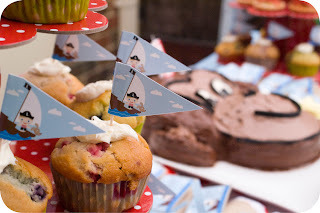 It started from my own business where I often needed to hire someone to help me out with various bits and bobs. 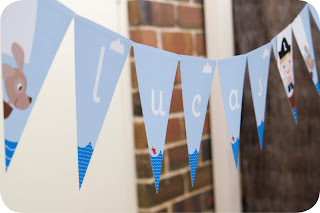 I've found it hard to find someone like-minded who understood me, my business and my personal responsibilities, so I decided to start an online directory where mums like us could find each other and help each other out. I've met some amazing mums through my own clients and always found that when you understand each other the end product is always a success. Clever Mamma has been about two years in the making but finally happening and so we'll see where it goes from here. 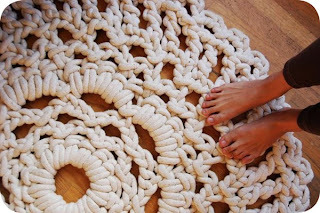 Fingers and toes crossed! PS: We are getting all Gen Y and even have a Facebook page too. Yippee for social networking! After spending a lovely afternoon catching up with this super lovely crafty-lady and her hubby, I feel all inspired to do my own bit of catching up in the teacups world. 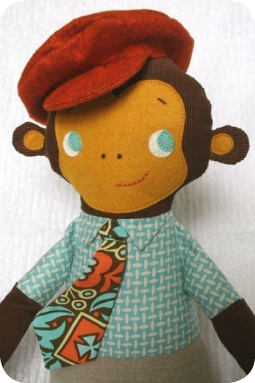 Mr Monkey has been finished for a couple of months now and is the secret to mummy getting up to a good three hours quiet time during the day. I'm very pleased to report that Little Mr Teacups has grown very fond of his little friend but I have been warned to make Mr Monkey the 2nd in case of emergency! Lucky for me there is enough fabric in the stash to do so, but finding the time... well that's another story. 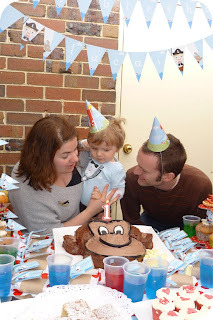 Little Mr Teacups has turned 1! We had a lovely day with sooo much scrumptious food, very special friends and family, and a yummy monkey even popped by. It was my first trip down the cake decorating train but I even impressed myself! 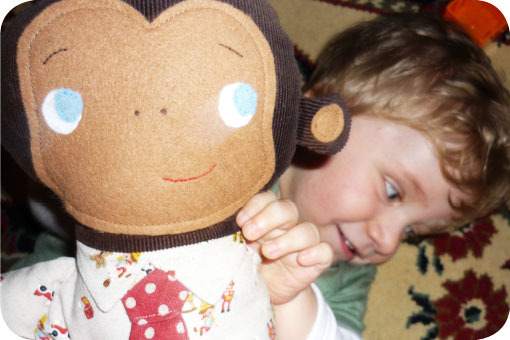 The little fella had lots of fun in an overwhelmingly-fun way and was lucky enough to pick up this handmade treasure. 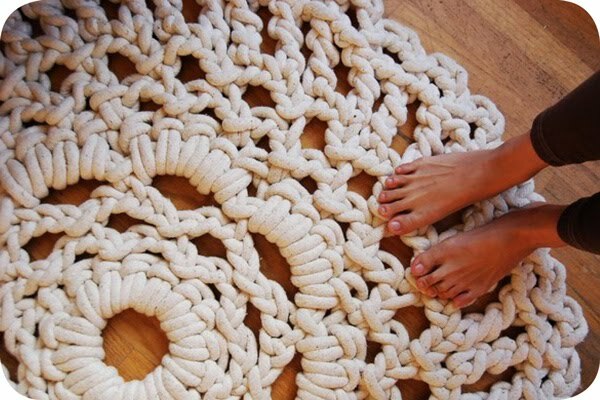 The minute I saw this rug I wanted it. Unfortunately the Teacups budget is not stretching that far, but if you have the $$ it would definitely be money well spent. Buy it here. have you heard about daisy lane? The swap card's making a comeback!!!! As a crazy swappie-lover I am very excited... can you tell?? What's even more exciting is that I was able to work with Lark in their latest and greatest venture. 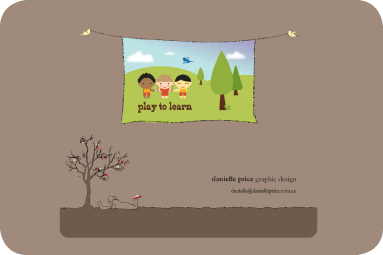 This is the logo I designed for them as well as a pattern that will be used across the range. 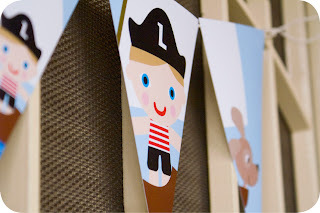 There are a whole heap of very cute products. If I were you I'd boot-scoot over here to check them all out and read all about this amazing story (trust me it's worth it!). Before Little Mr Teacups I was very good when new babies were being born, making little softies as presents. And yet with my own I have never found the time... I am determined though! 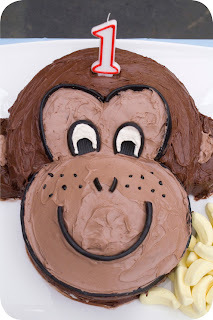 Before we have the 1st birthday (in about a month) Mikey the Monkey WILL be made... Maybe this post will be the encouragement I need (or guilt me into it!). I am co-ordinating fabrics now from my stash which in itself could take a while. You can find the pattern here. fancy a walk with the ducks? 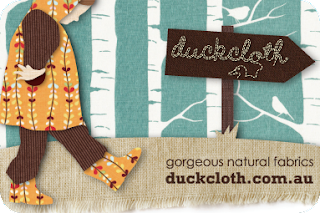 The latest ad for Duckcloth designed by me (with the help of some very beautiful fabric, including Lara Cameron's Birch Forest in Robins Egg). 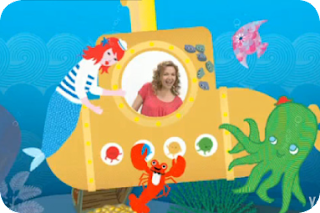 I have decided that now that I watch children's tv, I may as well enjoy it just as much as Little Mr Teacups. 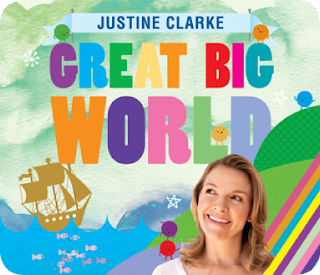 Enter... Justine Clarke's 'Great Big World' DVD! 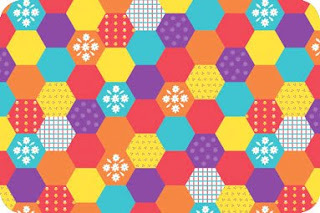 With art direction by the super talented Beci Orpin it's a visual feast for bubs and mums alike. I think I may have even gotten over the thought that Alf Stewart might pop up at any minute. 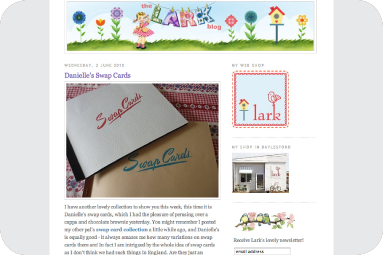 If you'd like to sneak a peek at my very treasured swap card collection, I'm very happy to report that the lovely Allison from Lark has featured it on her blog. There's lots of my faves on there but I do think this one is still my bestest ever. Ummm… a little bit about me. I’m a work from home mummy/graphic designer with a slight obsession with swap cards from the 70s, baking muffins and you guessed it, a crazy tea-habit.